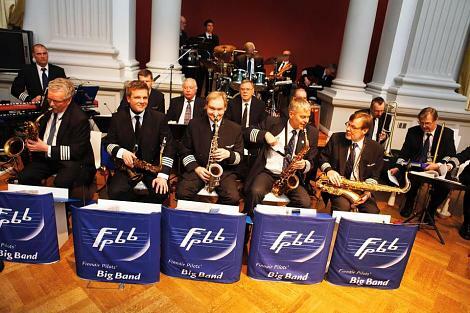 Thu 20.04. at 19, Sat 22.04. at 16 & 19 in Tartus, Eller Music School Tubin Hall, Sat 22.04 at 16 on Stage of Supilinna päevad, international guests Finnair Pilots Big Band (FIN), Valmiera Big Band (LAT) and conductor Raitis Asmanis (LAT). 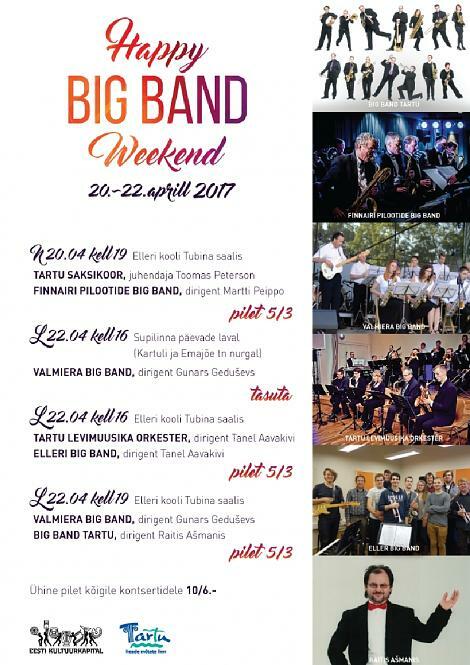 HAPPY BIG BAND WEEKEND 20-22.04.2017 in Tartu Thu 20.04. at 19, Sat 22.04. at 16 & 19 in Tartus, Eller Music School Tubin Hall, Sat 22.04 at 16 on Stage of Supilinna päevad, international guests Finnair Pilots Big Band (FIN), Valmiera Big Band (LAT) and conductor Raitis Asmanis (LAT). Big Band Tartu met a lot of guest conductors and other big bands during all the years of activity, with whom we continued to communicate. So we know our sommon interests, wish to lissen and share eachothers music and ideas, like to meet and study something new. Thatfor we organize 3rd International Happy Big Band Weekend 20-22nd of April 2017 in Tartu, Estonia. 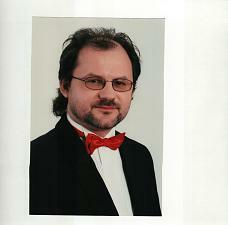 Star of this weekend will be Mr. Raitis Asmanis - conductor from Jelgava, Latvia, playing with us great Latvian music by composers Raimonds Pauls and Gunars Rozenbergs. From local forces will help us Tartu Levimuusikaorkester, Big Band of Eller Music Shool and Tartu Sax Choir. 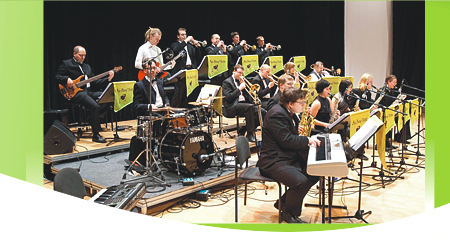 Big Band Tartu as organizer has pleasure to work with Mr. Raitis Asmanis and prepare a program of great Latvian music. Fri 21.04 at 19-21 and Sat 22.04 at 10-15.